KIT's researchers succeeded in producing renewable methane from a biomass-based synthesis gas mixture in their pilot plant for honeycomb methanation. The quality of this synthetic natural gas (SNG) is comparable to that of fossil natural gas and can be used as fuel in co-generation and heating plants as well as in cars or trucks. The pilot plant was designed and tested by researchers of Karlsruhe Institute of Technology (KIT) and the Research Centre of the German Technical and Scientific Association for Gas and Water (DVGW). "Chemical energy carriers have a high energy density and are particularly attractive for the mobility sector," says Felix Ortloff, Head of the "Process Engineering" group of the DVGW Research Centre at KIT's Engler-Bunte Institute (EBI). 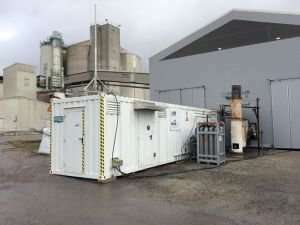 Biogas facilities produce the renewable gas mainly by fermenting biological waste. In countries with a large forestry sector, such as Finland or Sweden, there is a high potential for the production of SNG from waste wood. By means of biomass gasification, a synthesis gas is produced, which mainly consists of hydrogen, carbon monoxide, and carbon dioxide. This mix can then be converted into high-quality methane by methanation. Researchers of KIT's Engler-Bunte Institute and the DVGW Research Centre have now successfully tested a highly efficient methanation process for a period of several weeks in the city of Köping, Sweden. 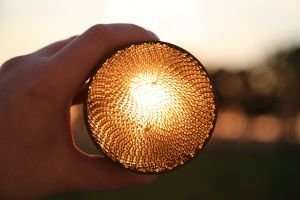 The core components of the plant are honeycomb catalysts that were developed and optimized for use by the "Catalytic Fuel Conversion" group of the EBI Division of Fuel Chemistry and Technology (EBI ceb) headed by Siegfried Bajohr. "In a single-stage process, metallic nickel catalysts convert hydrogen and carbon monoxide and, in case of sufficient hydrogen supply, also carbon dioxide into methane and water," Siegfried Bajohr says. The pilot plant of container design was coupled to a biomass gasifier that supplies the carbon-containing gases required for chemical reaction. Within this complex, KIT's methanation plant reliably converted synthesis gas into methane for a period of several weeks. "The synthetic methane produced was then applied as fuel in the natural gas vehicles of our Swedish project partner Cortus AB," Bajohr adds. "Apart from use in natural gas vehicles, methane can also be fed into the existing European natural gas infrastructure," says Felix Ortloff, EBI. In the opinion of the scientists, methane can already replace fossil natural gas in many applications today. "Moreover, the technology can also be applied in the power-to-gas context," Ortloff adds. In this case, water is split into hydrogen and oxygen by electrolysis using renewable electric energy. Then, the hydrogen reacts with carbon dioxide to synthetic methane. Apart from strain reduction of power grids, integration of biogas or biomass gasification plants in power-to-gas concepts is considered to be advantageous by researchers. Production capacity of the plants might be doubled, as the carbon dioxide arising from biogas production is converted completely into methane. "Our pilot plant is characterized by a highly compact design and, hence, high mobility," Ortloff says. "When installed in a cargo container, it can be tested anywhere at remote biogas facilities, in rural areas, or in combination with other CO2 sources that might be relevant in the future, such as various industrial processes," he says. After operation in Sweden, the pilot plant now is on its way back to Karlsruhe. "The plant will be integrated in the infrastructure of the Energy Lab 2.0 on KIT's Campus North. We want to further improve honeycomb methanation and optimize the catalysts for use in much larger facilities" says Siegfried Bajohr, the scientific coordinator of the pilot plant.